I thought that I had found my highlighter for life in the Stabilo Boss until I met the Platinum Preppy. The Boss highlighters are uniquely shaped which is either a good thing or a bad thing depending upon what grip works for you, but where they really shine is the fact that you can leave the cap off for four hours without it drying out. This is extremely convenient. Plus, they are refillable, but I digress. This isn't a review about the Stabilo Boss highlighters. It is about the Platinum Preppies. And boy did they change my perspective. The body of the Platinum Preppy is translucent and has a cap with a bright translucent color that matches the highlighter color. The translucence of the body is helpful as it lets you see the level of the cartridge in the pen. The Preppies come in five colors and refills for all five colors are readily available. When using the highlighter, the first thing I noticed was that it was extremely wet. The wetness fades the more you use the highlighter, but it is noticeable for the first few uses. Wetness aside, the pigments are amazingly bright and what I found to be truest to the neon many highlighters try to represent. They do go through to the other side of some papers, but it is not so much that it is distracting and there is a bit of a drying time needed (~one minute or so). 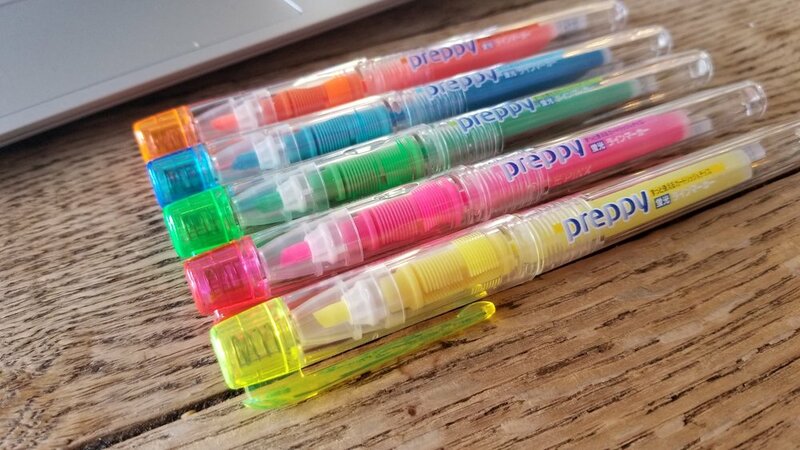 What won me over with these highlighters was the bright, bright pigment, its cartridge based refill system, the replaceable tip, and its round, pen-like barrel. Even though I still love the design of the Stabilo Bosses, the pen-like form factor of the Platinum Preppy allows it to be a bit more controllable. One cartridge for the Platinum Preppy lasted me about a week of heavy highlighting (100 pages of journal article highlighting; I'm a heavy highlighter). I definitely think the Platinum Preppies are worthy of a purchase if you like bright highlighters. You can either buy singles for $2.50 each or a 5-pack for $12.50 over at JetPens. Normally here at the Weekly Pencil, I talk about, well, pencils. As I began to use more and more pencil, I found that there were times when I wanted to highlight something I had written, but had no idea which highlighter I should use. For a while, I kind of just used whatever was within reach with varying results. It wasn't until I started to attend college that I began to have a need for a highlighter that worked properly for my needs and was vibrant enough to be useful. I'm not going to lie-- this task was daunting. I did eventually find my dream highlighter, but it took time and frustration. That's when it occurred to me-- what if I wrote a blog post about my experiences with different highlighters so you DON'T have to go through the aggravation like I did. Now, here we are. I review several highlighters so you don't have to. You're welcome. Before I get started I want to define some terms. There are three different kinds of highlighters I am going to talk about in this piece. The dry, wet/marker-type, and the gel. Dry highlighters can be described as crayon-like or, for the harder ones, colored pencil. They tend to lay on top of the paper and often smudge pencil, but do a fine job with printer ink and pen ink. They need sharpening like regular pencils. The wet/marker type are the highlighters that most of you probably use on a semi-regular basis. They tend to get absorbed into the paper you are highlighting and some wet highlighters do a good job of not smearing pencil markings. Wet highlighters can either be water based or alcohol based. The alcohol based highlighters tend to work much better than the water based since they have a shorter drying time and work on a variety of papers. Water based highlighters can tear up the paper if you apply too many layers and take forever to dry. The only plus to water based highlighter usage is that they are cheaper. *note: while these statements are, in fact, true, there are some exceptions to the assertion that alcohol is better than water; it depends on the quality of the marker itself. Finally, gel highlighters are unique in that they offer a smudge-free, non-bleedthrough experience. These type of highlighters work best on thin paper such as paper found in the Bible or Quran or on surfaces that are non-porous. These highlighters come with some drawbacks though. They are not precise and often have a very large, round tip. Also, some can be incredibly waxy to the point of being unusable. I would like to note that sometimes people conflate dry and gel highlighters, but for the purposes of this overview, I will put them into two separate categories: dry (sharpenable) and gel (everything else sans wet). Now, on to the reviews!